You know I love this developer. The guy’s an optimist and a realist. He says if you don’t download his program, it’s a crime. We have seen a lot of ways to get people to download a program, but we’ve never heard it put that way. So, my fellow netizens, if you don’t download this program, you’re committing a crime. Those are his words, I am not kidding. Here is a quote: “..missing Image Tuner would be a crime!” If you don’t download Image Tuner, you’d miss it, and therefore, it would be a crime. So I downloaded it and used it and therefore I speak to you today as an innocent man trying to save you from yourselves. Don’t miss this program because that would be a crime. I don’t know what the punishment is, probably too odious to contemplate. I’d really hate to see you hauled off to a big, red barn in some deserted area of Lower Slobovia, and tied to a chair and forced to listen to Rebecca Black sing “Friday” for 30 straight days without a break. I think that’s what the punishment is for missing this program. I have done the right thing and have downloaded this program and used it so I have not missed it. You might want to listen to Rebecca Black “sing” once before you decide if you want the punishment or the program. Even if you didn’t have a single photo to edit, you really should download Image Tuner, because I don’t think many of us have ears calloused enough to endure 30 days of Rebecca Black’s “singing”. I’m not making an artistic judgment here, I’m just saying. Maybe 30 days in a cold, dirty, red barn in Lower Slobovia listening to Rebecca Black appeals to you, if so good on you! To me I’d rather have Image Tuner or even broccoli or coconut than listen to Rebecca Black. But Image Tuner is a lot better than coconut and certainly better than raw broccoli (which has worms by the way), and way better than listening to Rebecca Black – IMHO. 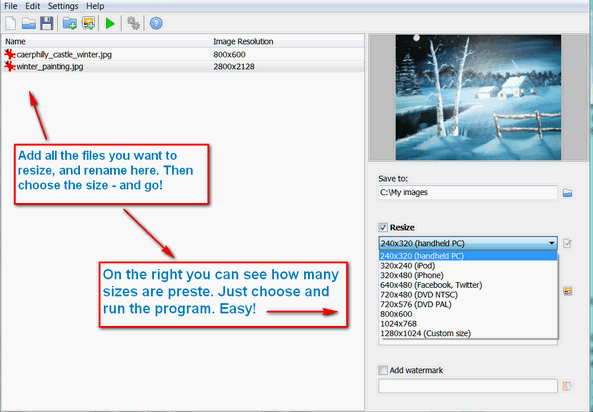 “Most users don’t need Photoshop functionality to fulfill fairly simple daily image processing tasks. What do most of us do with images? We download photos from our digital cameras, rename them to get rid of standard naming patterns, resize them for uploading to social networks, phones and forums, convert them for compatibility with certain programs and make other fairly basic modifications that allow us to use images elsewhere and in a different manner. Although the market abounds in image editors and converters of all shapes and forms, most of them suffer from insufficiently interfaces that are either confusing or take too much time to get used to. If you are looking for a tool that will be able to do everything you need to do with images every day, missing Image Tuner would be a crime! Evidence above shows that we actually tested this program and that we have not missed Image Tuner and therefore don’t have to have to endure even one single minute of Rebecca Black – can YOU say the same? You could if you downloaded and tried our freeware pick of the week – Image Tuner.